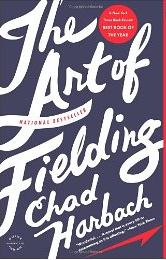 I finished listening to The Art of Fielding (Chad Harbach) yesterday. I can't say I wound up loving it -- Harbach makes his characters weaken and fail until every last one of them is so low he/she can't go any lower -- but when I stopped at the bookstore to look up this quote, I was amazed to learn that it was his debut novel. That doesn't make up for what he did to some perfectly nice characters, but it does raise my opinion of his craft -- Harbach will be one to watch for in the future. The Art of Fielding is literary, academic, romantic (straight and gay), youth, aging, and baseball, baseball, baseball. I love to teach math. People know me as a literacy person but math is kind of more my thing. I am really a math girl--love math and love to watch kids make sense of it. So, I am excited to get back to teaching math. I have three books on my list related to math teaching. 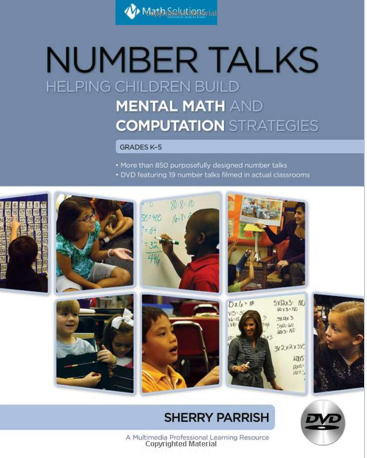 NUMBER TALKS by Sherry Parish is one that lots of teachers in our district are talking about. It is new to me and it looks fabulous. Looking forward to thinking about new ways to help kids make sense of number. MATH EXCHANGES by Kassia Omohundro Wedekind is one I skimmed when it came out but didn't dig into like I will this summer. 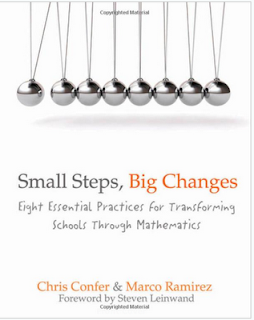 Even though this book is focused on primary math instruction, I know it has lots of implications for older kids. I interviewed Kassia for a Choice Literacy podcast and was so inspired by all she had to say. Really excited to revisit this book with a classroom in mind. 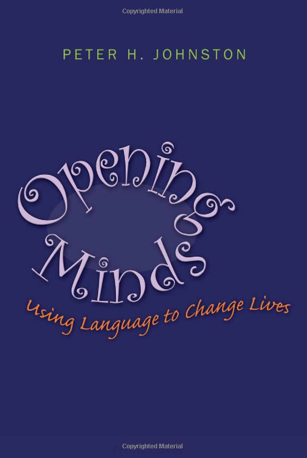 I want to reread OPENING MINDS by Peter Johnston. I loved this book when I read it earlier this year but I want to start the school year off with it fresh in my mind. 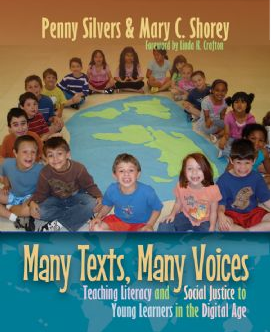 MANY TEXTS, MANY VOICES by Penny Silvers and Mary Shorey is one that I am extra excited about. 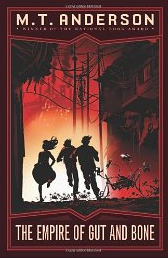 Literacy, Social Justice, Digital Age--love the way these three things come together in the description of this book. I can't wait to read the stories of this teacher and her students. You can preview this entire book online at Stenhouse. 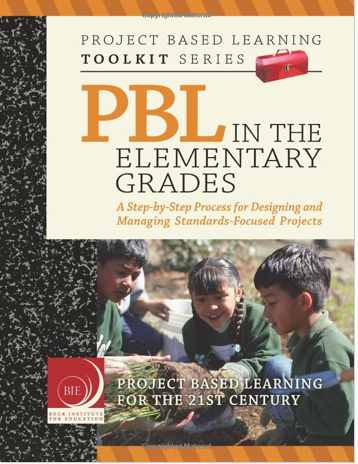 PROJECT BASED LEARNING IN THE ELEMENTARY GRADES from the Buck Institute is one I want to read to think about how to better think about projects in a standards-based age. I was hoping to take a workshop in our district on the topic but really didn't have the time so I thought I'd fit the book into my summer reading. 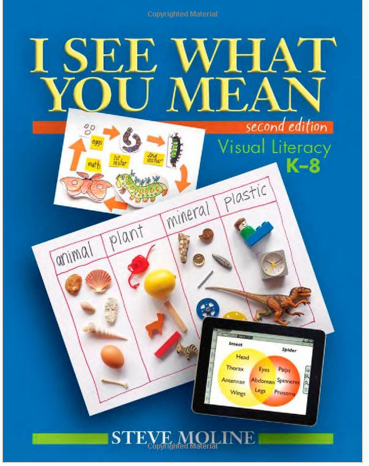 I read the first edition of I SEE WHAT YOU MEAN by Steve Moline that was published YEARS ago--before anyone was really talking about visual literacy. And it was brilliant. So I am excited to read this new edition and Moline's new thinking around a topic that has become even more important in the last few years. I think this will help me think through visual literacy across content areas. 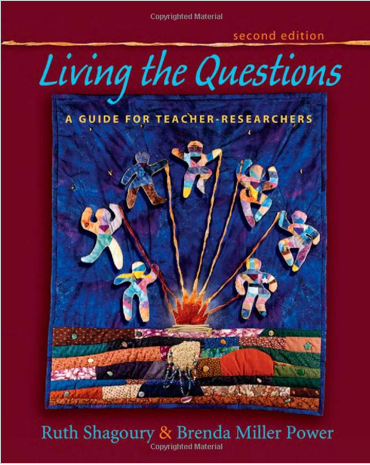 I also want to read the new edition of LIVING THE QUESTIONS by Ruth Shagoury and Brenda Miller Power. I loved the first edition of this book and can't wait to read their new thinking on the ways we live in our classrooms. 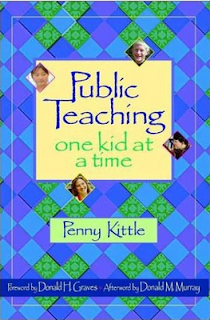 I'm a huge Penny Kittle fan and have not read her book, PUBLIC TEACHING: ONE KID AT A TIME. I keep hearing about it a a great summer read and it looks like one that will energize me to start the year grounded. 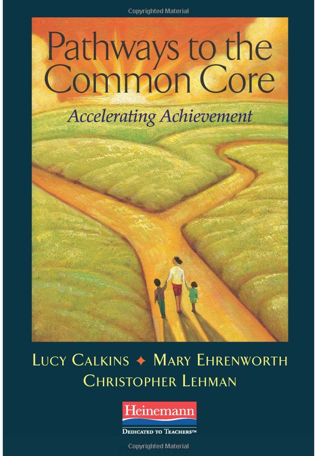 Finally, I'd like to do some reading around Common Core and PATHWAYS TO THE COMMON CORE by Lucy Calkins seems perfect. I like Calkins' thinking around the CC issues and am looking forward to reading her ideas about how best to implement. Hmmmm. That's a lot of books. But I am hoping to dig into each of them sometime this summer! I was thrilled to receive a review copy of WUMBERS from Chronicle Books. I am a huge Amy Krouse Rosenthal fan and love the fun that she has with words. 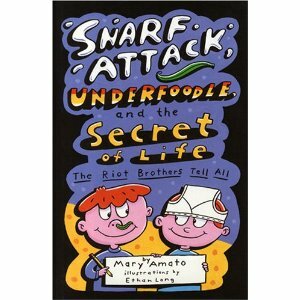 The heading of the press release says, "GR8 NEW BOOK IS 1DERFULLY SILLY". The entire book is told using numbers as parts of words as in the press release heading. 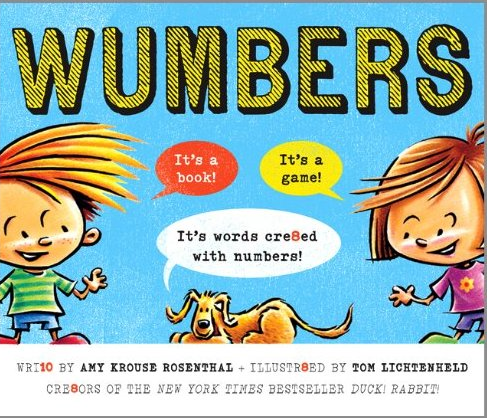 Each page sets the scene and the words and numbers work together to tell the story. Reading the book feels like solving a riddle and I can see kids having a great time playing with this kind of writing once they read this book. The author/illustrator team say that the book was inspired by William Steig's C D B! book so it would be fun to pair these. This seems like a great time for a book like this because kids see so much of this kind of word play in their lives with texting, Twitter, etc. One of my favorite parts of this book are the endpages. There are several talking bubbles with questions for readers using numbers/words to ask the questions. For example, one of my favorites is, "Are you usually prompt or do you 10d 2 be l8 and keep others w8ing?" Even the dedication, the author bios and the title page include fun with word/number combinations! I love the whole idea of this book and can't wait to share it with kids. I'll keep it with my word play books but I think it will be a good one to use early in the school year when we are learning about keeping a writer's notebook. Playing with words like this is a fun thing that I think lots of kids might want to try if given the invitation. It will be fun to see what they come up with! My class is going to have an EXTRA special last Poetry Friday of the school year today. Greg Pincus is coming to visit, all the way from California...via Skype! To get ready for Greg's visit, we've been reading his poems together with my iPad connected to the SmartBoard, and in small groups on some of the school's iPads. After I walked them through the punny logic of poems like "The End" and "Book Report on the Thesaurus" they were all primed to groan on their own (or say, "OH!!!") at the end of "Unfair" and "The Biking Blues." When they set off on their own with the poems, I had to give some occasional help -- reminding them to use the Kindle's dictionary when they didn't know the word "cruciferous" in "Broccoli and Cauliflower," reminding them to go back and look at the title to make meaning in "The Lament of Thursday the 12th." But I knew they were really learning to navigate Greg's style when a boy delightedly showed me the math problem hidden in "A Doubleheader Sweep" and I had to admit that I had completely missed it! 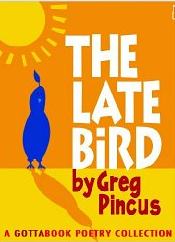 If you have access to Kindles or the Kindle app on any devices in your classroom (best in 4th grade and up, because that's when they are really starting to be able to navigate puns), I highly recommend Greg's collection of poems. Linda has the Poetry Friday roundup today at TeacherDance. 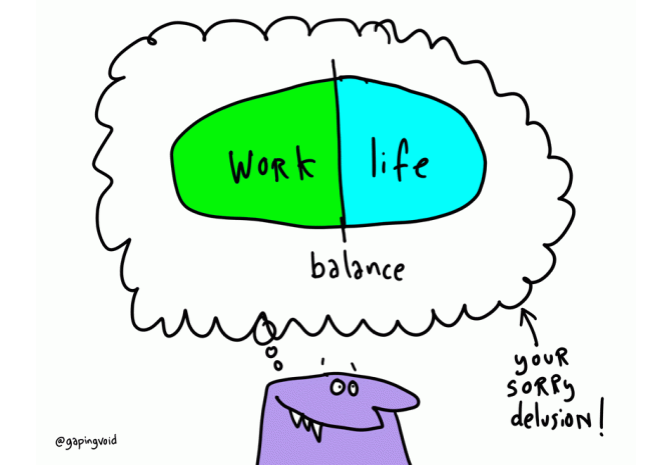 Labels: balance, end of school, nuff said? 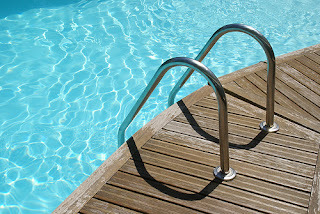 Our beloved Sunday water aerobics instructor was replaced recently. The class is having a hard time adjusting to the new instructor. She uses a different set of moves and it's hard to hear her instructions. She has dismissed one of my favorite moves, saying that it goes against the guidelines of <insert unknown acronym>. • Talk about changes they've undergone in the past. List the positives of change along with the negatives. 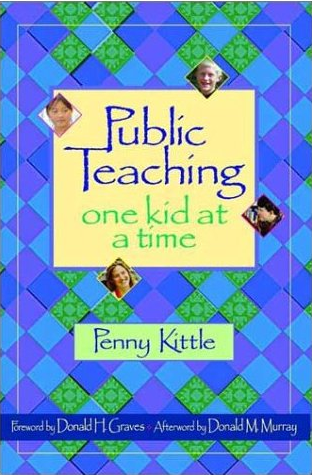 • Think about what they've learned from favorite teachers. Remind them that when you move from teacher to teacher, you carry them all with you -- you never really leave a favorite teacher behind. • Be patient. Give the new teacher a chance. • Ask for their input as we establish routines and norms and make the classroom ours. • Have them tell me the things they loved about teachers in the past...not that I could make any promises that I would be just like them, but so that we can explore my similarities and differences to their former teachers. • Be gentle as I guide them in their learning so that I don't completely contradict or disregard what another teacher taught them, but rather show them how learning is layered, and how the new learning they do with me will be added to, but will not replace their previous learning. 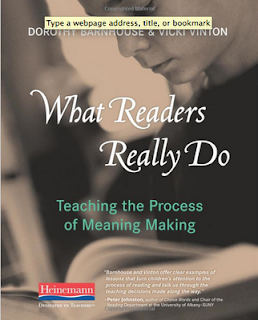 I read the book WHAT READERS REALLY DO by Dorothy Barnhouse and Vicki Vinton a few weeks ago. It was a great read and one that I highly recommend as a summer professional read. This is one of those books I wish I had written. The premise of the book is that we need to teach young readers the process of thinking deeply about a text--not teach them to think what we think about a book. A big part of the book is that as teachers, we need to be readers ourselves. That being a reader is the biggest thing that will impact our teaching because it will allow us to make our process of meaning making visible for our students. 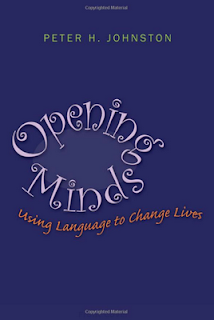 The authors say, "What's needed is a willingness to peer into the recesses of our own reader's mind, attending to the work we do internally that frequently goes unnoticed or happens so quickly that it feels automatic." The rest of the book really tries to make visible, the things we do as readers that help us make meaning along the way and to think about how to make that visible to children. The beginning of the book focuses on the importance of helping students achieve agency and independence. There is a section I love on Reframing Strategies as Tools, Not Products. And they talk about the importance and noticing and naming for students. "We Build the Lessons Around our Assessment of the Demands of the Text." "We Enter Stories Knowing that the Particulars Will Yield Universal Understandings"
The book shares student conversations, lesson ideas and other thinking about how to really empower students to make meaning. The authors show us tools to help students do that so it is a great combination of the thinking as well as the practice needed. This book brought a lot of my thinking together--thinking that I hadn't quite been able to articulate. It was the perfect book for me as I get ready to go back to the classroom--thinking about building agency and independence in readers. I think this book also helped me think through the Common Core talk about close reading and text complexity. One of my favorite new books on literacy instruction! I have always believed that teachers need to be readers. I know for myself, being a reader is important for so many reasons--I can better recommend books to kids. I know what it is like to love a book so much that it is hard to read anything afterwards. I can understand the decision-making that goes into abandoning a book. I teach differently because I am a reader and I read differently because I am a teacher of reading. Every day, my life as a reader impacts my teaching life. I was reminded about the importance of Teacher as Reader during my work toward running a 5K over the last few months. If you've been following my slow, but steady progress on my Reading Teachers Running blog, you know this has been a long road. I don't consider myself a runner but I did run (mostly) a 5K on Saturday. 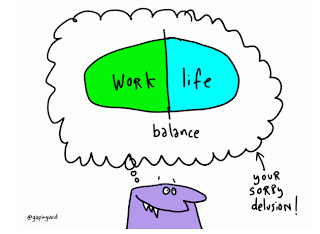 And, as always happens with me and fitness goals, I learned a lot about my life as a teacher in the process. 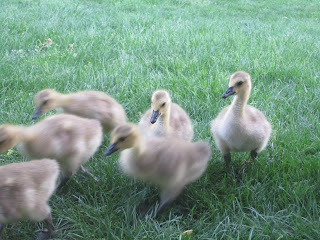 I started out wishing I was a runner as I often do when I decided to write about it in a post for the Nerdy Book Club. As I was writing it, I realized that I had not really given running my all. I mean I wanted to run and I read a lot about it but I didn't really set myself up for success in running. So, after writing that post, I realized I needed to get some help. I had tried published Couch to 5K programs but they never seemed quite right. I knew I needed someone who could really help me meet my goal, someone who was a coach and a runner. Someone who could TEACH me how to be a runner. I hired a running coach that I found online. Tonia at TMB Endurance Training who I found on a blog I love 365 Days of Awesome. I decided to hire her to write a plan for me and to coach me for the 16 weeks. My friends who have seen me start and stop many exercise programs over the years, were quite amused at this decision. No one was quite sure how someone could coach me without being here. How could I learn from someone online? If she was just going to say, "Finish strong! ", anyone could do that. I couldn't really put my finger on it at the beginning but I knew that hiring Tonia was one of the best decisions I'd made. Tonia helped me in a way that my local non-running friends could not. She did tell me things like "finish strong" but she also helped me through lots of challenges. And I trusted her because she was a runner herself. I knew when I just needed a pep talk from my friends and I knew when I really needed information about where to go next in my running. Before Tonia wrote my personalized plan, she sent me an extensive interview and then scheduled a 30 minute phone conference with me. She learned all she could about me and my needs, my lifestyle and my goals. Then she created a plan based on all she knew. Each week, we chatted a few times a week to check in. I asked questions, she sent reminders, etc. And I finished the 16 week training plan and ran the 5K. I could not have done this without the many cheeerleaders I had along the way-there are too many to name because I am lucky in life to have lots of friends and cheerleaders. But, I could also not have done this without an expert to support me along the way. I have always had cheerleaders to support me, but to run, I needed someone who was a runner and also knew how to coach and how to meet the needs of me, an individual. I realized early in the training, that Tonia was setting me up for a life of running. She was building things into my week (short runs and long runs) that seemed silly when I was only running 30 seconds at a time. But the habit of knowing there is a long run every week matters. She knew when to tell me to listen to my body and take the day off and when to push through. She let me know about her bad runs when I had a run that just didn't work. She knew when the thing holding me back was my confidence and not my ability. She knew all of this because she was a runner and she could use her expertise as both a runner and a coach to get me to the next level. The thing is, the people who run, and share their stories honestly have helped me get through my own challenges. There were lots of runners who taught me lots along the way. My friend Lynsey told me early on that "the first mile is always hard". It was a hard thing to hear when I couldn't possibly run close to a mile, but her words have helped me ever since I've passed that first mile run. Now I know that the first several minutes are harder and then I get into some kind of flow. Without Lynsey, a serious runner, giving me that piece of advice, I may have just thought running was only hard for me at the beginning. Understanding that the start of runs were hard for her made a difference to me. She was also the one that suggested I get an armband for my iphone because carrying it my hand could throw off my balance and give me one more thing to worry about while running. I trusted her to help me because she is a runner. Jen was kind enough to teach me early on that speed doesn't matter so much and that lots of runners start slow. I loved reading Dorothy's post about the Boston Marathon: Mile by Mile. She is one of my running idols and I knew how much the marathon meant to her because I read her blog religiously. It got me through many weeks of my running. The thought that she could struggle with any running event and be so honest about it was huge for me. Her story reminds me not to quit, even when I have to pause and take a breath. That my attitude is really my big problem as it was hers on that day. That I am not struggling because I am not good at this but every runner has good and bad run days, no matter where they are in their journey. And reading an interview with Dorothy this week, I learned that she didn't love running right away. I am amazed by this fact and it helped me this week, when I did not love running. Hearing that this runner did not love running at first gave me a bit of hope... I was just as relieved to read Heather's post on 365 Days of Awesome this week. She has had a bad few weeks of running and she is honest about sharing. But she isn't quitting because the running isn't going well. I trusted these stories because these girls are runners. And there are Sarah and Dimity at Another Mother Runner who willingly share their stories and the stories of others so that we can all find what works for us. I learn from every mother whose story they share and their two books RUN LIKE A MOTHER and TRAIN LIKE A MOTHER helped me through these 16 weeks of running. The constant support of such knowledgable people mattered. They were runners and they know the challenges of fitting running into a full life. I trust them completely because they run. And Meredith is just a year or two ahead of me as a runner. She ran her first 5K last year and I was there to cheer her on. But she ran next to me for the full 5K on Saturday. When she told me to keep going, I knew that it was more than cheering--she knew from experience that I'd be happier if I didn't stop. She knew that it was hard because she had experienced her first race so recently. And my virtual running partner, Katherine, texted me throughout the week. She had worked with Tonia and had run her 5K the week before. She knew what I would experience. I trusted them because they run. 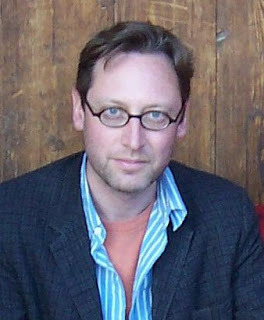 Mary Lee's husband, A.J. gave me last minute tips on navigating the crowd and the course on the morning of the race. I listened to him and trusted him because he is a runner. So, back to my lesson about teaching. It definitely took a village to get me to the 5K. It took cheerleaders and friends, but more importantly, it took runners. Runners who were willing to help me, to teach me and to invite me into the world of runners. The online bloggers who I do not "know" and probably never will were critical to my learning because they are runners. I trusted my coach because she was a runner. And all of the advice and tips I got along the way mattered because the people who gave them had at one point experienced what I was experiencing. I trusted them because they had the experience and because they understood what I was going through. How can our students trust us as teachers of reading if we are not readers ourselves? How can we talk authentically with kids about books if we are not truly interested in reading them. How can we help them through challenges and help them move forward if we have never experienced what they are experiencing? Yes, our kids need cheerleaders--they need people who love and support them in all that they do. But they also need teachers, teachers who read. Teachers who they can trust to teach them about reading because they are readers themselves. It definitely took a village to get me to the 5K and I imagine the village of support will need to continue as I continue running. I DEFINITELY need cheerleaders. I could not really live my life without them. My friends are amazing people. But as a runner, I need more than cheerleaders, I needed teachers. I needed teachers who not only cheer me on but teach me what it is to be a runner. I plan to hire Tonia again soon to help me with whatever running goal I come up with next. I know I will need more than cheerleaders if I want to move forward again. I stood on the sidelines of the running community for a very long time. It wasn't until I found experts to learn from, experts who had been through what I was going through, that I could get through those first few weeks successfully. As I wrote in my Nerdy Book Club post in January, there are so many children standing on the edges of the Nerdy Book Club, wanting to be part of this reading club. These kids deserve teachers who read. the breadcrumbs had already been tossed. and suddenly my siblings were nowhere to be seen. of that bending blade of grass. Katya has today's Poetry Friday roundup at Write. Sketch. Repeat. Who can resist a book with their name in the title?! 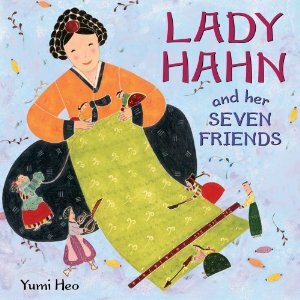 In this Korean folktale, Lady Hahn is a seamstress. Each of her sewing tools claims to be the most important. Lady Hahn overhears them and grows angry, claims to be more important than any of the tools, and throws them into a box. The tools feel mistreated and misunderstood, so they hide from Lady Hahn, who has a miserable time trying to sew without them the next day. In the end, they realize that they all need each other to get the job done. This Lady Hahn is more likely my mom than me, though. The Lady Hahn who raised and clothed me with hand-sewn blue-ribbon-at-the-county-fair creations made on her little black Singer worked miracles with needle and thread and fabric. She made baby dresses with smocking down the front, recital dresses from purple crepe, baton twirling costumes of velvet with sequins hand-sewn on, a dirndl from a German pattern, and even BARBIE DOLL CLOTHES with buttons so tiny I'm not sure how she didn't go blind sewing them on! Yes, this is probably a book best suited for preschool readers, but what's not to love about a new, interactive version of The Three Little Pigs? The heavy cardboard cover has circular window cut-out, through which we see the three little pigs. The pages are heavy stock, and the text is very simple, with one line per page on the left and an illustration on the right: "First pig building a house. First pig inside the house. One wolf huffing and puffing." 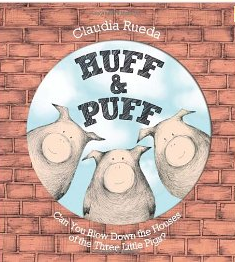 When we get to "One wolf huffing and puffing," the illustration page has the words "HUFF & PUFF" written really big on the texture of the corresponding house. The "belly" of the ampersand is cut out so that the reader, playing the wolf, can huff and puff and blow the house down. Well, we all know what happens when the wolf gets to the house of bricks, but that doesn't mean you know what will happen at the end of this book! About a month ago, Franki wrote about her Kindle reading. Recently, I've gotten a little download happy, so I thought it might behoove me to look through what I've got on my Kindle so I can make a plan to get it all read. Heaven forbid that I become a Kindle hoarder!! If you have a Kindle/Kindle app, I suggest that you sign up for the Kindle Daily Deal email from Amazon. I rarely buy the deal, but when it's a good deal, it's a REALLY good deal. Because of Winn Dixie was the Kindle Daily Deal a couple of weeks back, and so for 99 cents, I got a copy with my school account and loaded it on the 6 school iPads, and for another 99 cents, I got it for all of my own devices. I LOVE reading Because of Winn Dixie as a read aloud, and the movie is one of the few children's book-to-movie adaptations that I really love. Whole sections of text are in the movie verbatim. So I'm reading it aloud, and while most of the children are reading along in the book, eight each day are getting the experience of Kindle reading on the school's and my iPads and on our classroom Kindle. Very fun! It's getting to be that time in my career when people are starting to ask, "So...how many years do YOU have left before you retire?" The freedom of retirement is starting to sound REALLY appealing to me, but the financial piece scares me witless. When 7 Money Rules for Life by Molly Hunt came up on the Kindle Daily Deal recently...click...purchased. I can't remember which was the Daily Deal, but both How We Decide and Imagine--How Creativity Works by Jonah Lehrer are both on my Kindle shelf. I've started Imagine. It's fascinating. The Best American Short Stories, edited by Geraldine Brooks was an easy sell -- I love Geraldine Brooks, and reading a collection of short stories edited by her seems like a way to read over the shoulder of an author I love. The Best American Sampler will be a fun way to graze the Best American series. I can't bear to get rid of any of the professional books that fill an entire bookcase at home and a shelf at school. At the same time, I have exactly ZERO room to fit another professional book anywhere... except my Kindle! Here are the professional e-books I have so far. I love having them at my fingertips so that when I am planning a lesson or a unit, I can turn to them for ideas no matter where I am, rather than waiting until I can get to one of my physical shelves. Brought to you this week by Mary Lee. Let's start with the pile that's on my nightstand. Two reasons why I listened to will grayson, will grayson (finished last week). #1 I loveloveloved The Fault in Our Stars and realized that I need join the John Green fan club. #2 The more I listen to audio books, the more I appreciate a great reader/production. While others are reading all of the Newberys and Caldecotts, I'm thinking I might try to listen to all of the Odyssey Award winners. 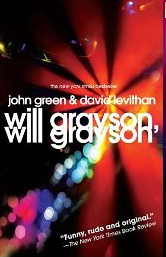 will grayson, will grayson was an honor book in 2011. My current audiobook is The Art of Fielding. It and King's 11-22-63 were "follow the crowd" purchases based on "Best Books of 2011" lists on Amazon and Audible. I completely took a risk on both books and I've been pleasantly surprised by both. The Art of Fielding is a baseball book...and SO much more. I love the multiple points of view in it (so similar to will grayson, will grayson!!) and the way the author surprises me to the point of honest-to-goodness out-loud gasps at the plot turns. 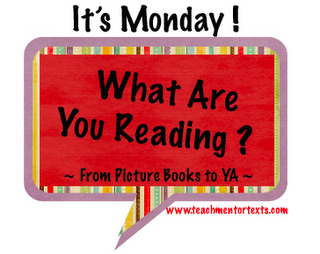 Check out what other folks are reading at Teach Mentor Texts. Happy reading! I knew ONE FOR THE MURPHYS would be my kind of book. I am all about people being changed and growing because of others. I knew right away that this book might be a tiny bit like PICTURES OF HOLLIS WOODS by Patricia Reilly Giff, THE GREAT GILLY HOPKINS by Katherine Paterson and BABY by Patricia Maclachlan--books that have lived with me for years. This is the story of Carley Connors, a middle school girl who is placed in foster care after being hurt by her step-father. Carley's mother is in the hospital recovering from her own injuries from her new husband. Carley is tough and sarcastic. She has a hard shell but is easy to get to know and love. She is placed in foster care with the Murphys--a family who has never had a foster child and a family very different from the one she grew up in. The Murphys take her in and help her to heal. I don't want to give too much away but this book is about the power of love and the lasting impact of those who love us. How love can change a person. 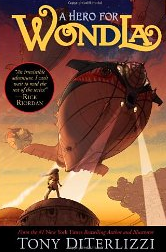 It is a perfect middle grade novel in terms of the amount of depth and emotion that are a part of it. The book deals with serious issues around families, abuse and love but does so in a way that is very appropriate for middle grade children. I felt like it was honest and hopeful at the same time. I absolutely loved this book--through all of the laughing and the tears. 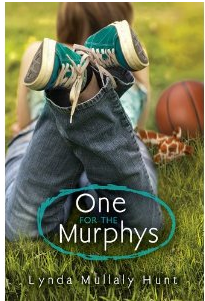 Carley Connors and Mrs. Murphy are two characters who will stay with me for a very, very long time. Probably forever. Poetry Friday -- O Me! O Life! Yes, that powerful play is going on, and we are careening hurtling rushing through these last days, through this last act, through this last verse of the song we've been singing since last August. Almost time for the curtains to close, for the conductor's baton to lower. 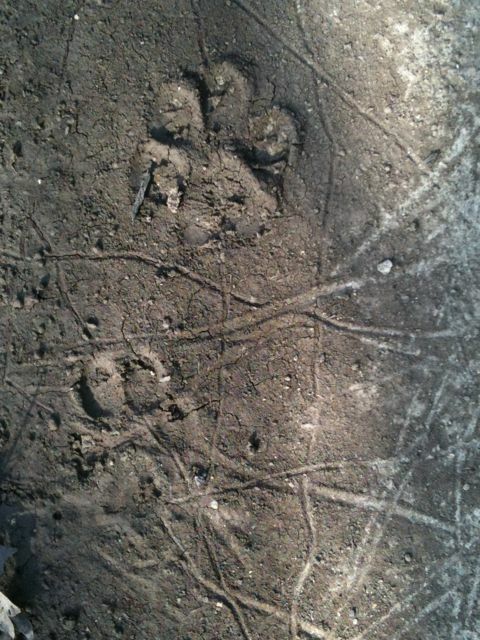 What tracks will we leave in these children's lives? On these children's hearts? 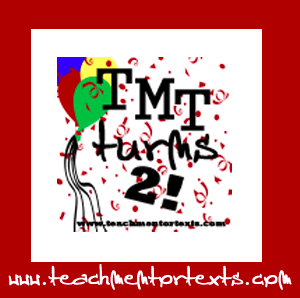 Happy Birthday TEACH MENTOR TEXTS! I am thrilled to be part of the 2 year blogiversary celebration of one of my favorite blogs--TEACH MENTOR TEXTS. I have learned so much from Jen and Kellee over the last two years (and have spent lots of money on great new books!) As part of the celebration, they are asking bloggers to share their favorite mentor texts. I decided to write about an older book--one that I love when it comes to helping kids see what is possible when it comes to writing, HEY WORLD, HERE I AM by Jean Little. I think I learned about this book in 1991 when I attended the Teachers' College Summer Writing Project at Columbia. (I know that this was long ago because I remember recording every keynote on a very high-tech portable cassette recorder!) 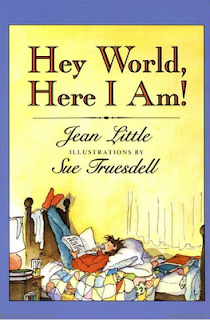 And when Jen and Kellee asked me to share a favorite mentor text, this one came to mind. It came to mind because it is one that impacts kids' writing every single year. HEY WORLD, HERE I AM is a poetry book, a journal and more. It was published in 1989 and had many great reviews and awards that year. And even though it is a 1989 publication, so much of it still rings true for children today. This book is a collection of entries by Kate Bloomfield. She writes about siblings, friends, loss and school. She writes with passion and joy and with the insights of of a tween girl. Each and every entry in this "notebook" is one that children can learn from. I have used this book when launching writers' notebooks as students begin to see all the ways they can make sense of their lives on paper. I've use pieces separately for specific minilessons. "Not Enough Emilys" is one of my favorite pieces in this book. In this piece, the author talks about her friend Emily--but instead of telling us about her by describing her, we learn about her through her actions. 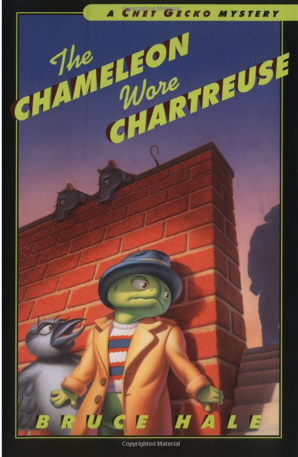 It is a powerful piece for both readers and writers learning about character. I've used this book as a mentor for readers learning to think deeply around text. A poem in the book called "Five Dollars" is about a time when Kate stole $5 from her mother's wallet. The poem is about guilt and is an honest reflection that gets readers thinking in a way that helps them understand the character more deeply. Another poem I like is poems in this collection is Louisa, Louisa. This is a great poem about a new baby. Welcoming her into the world and celebrating her new life. I don't think there is a piece in this book I haven't used with students. It is a book I really couldn't live without in my teaching of reading and writing. Kate is a character I love and I love coming to know her through her writing. You can take a peek into this book at the Harper Collins site. 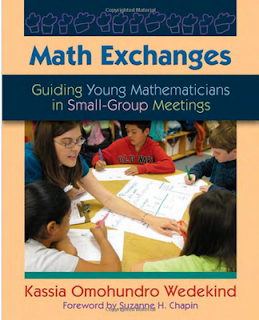 And it is in paperback so it is doable to buy several copies of this one for your classroom. 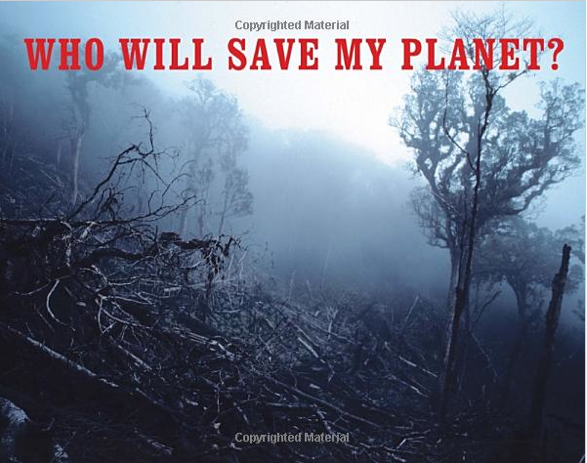 I picked up WHO WILL SAVE MY PLANET by Maria Cristina Urrutia at Cover to Cover. It is a wordless book and the story it tells is a serious one. This is a small book filled with photos of our world. The photographer uses two page spreads to show us the depth of the problems--how the Earth has become ruined. In each two page spread, Urrutia shows two intense photos. 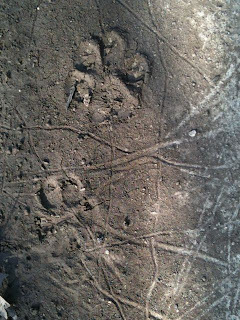 One shows the problem--a forest of trees chopped down, an animal in a cage, etc. The other side of each spread shows a connected picture--showing how things should be if we take care of things. There is not one word in this book but the photographs tell a powerful story of where we are in taking care of our world. I picked this up for many reasons--I am always looking for wordless books because I think they are great to begin talk around ideas. I also thought this would be a great conversation starter around visual literacy, how to read images, etc. This book has lots of possibilities. I love when I find a great new nonfiction picture book that is perfect for young children. EGGS 1-2-3: WHO WILL THE BABIES BE? is my new favorite find in this category. This lift-the-flap book is by Janet Halfmann. This book is not only a nonfiction book--it has great, poetic language and it is also a counting book! 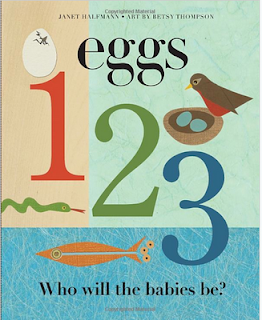 Each two-page spread gives readers a little question about eggs in the illustration. For example "Four eggs, of sky blue, in a nest of grass and mud on a branch in a backyard. Who will the babies be?" When you lift the flap, you read, "4 robin chicks, with beaks open wide, begging for juicy worms. The book goes from 1-10 with a fun last page of more counting. I like this book because it weaves in just the right amount of information about the eggs and the babies that hatch from them. 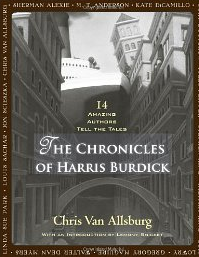 I love it for young readers and I also love it as a mentor for writing--a great format for nonfiction writers with information shared using great language. April was a month of POETRY MADNESS in the Riverside Library. We started out by looking at 64 poetry books from the library. Rotating from one table to the next, students chose a poetry book they loved. The top 16 books made it to our Poetry Bracket. 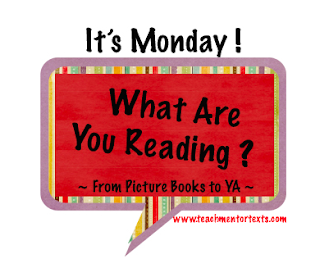 Then, each week, we looked at the challenges on the board--reading poems, sharing thoughts and voting on which book we liked best in each challenge. Each week, a few books moved to the next level of the bracket while others were knocked out. Until we were down to just two books. 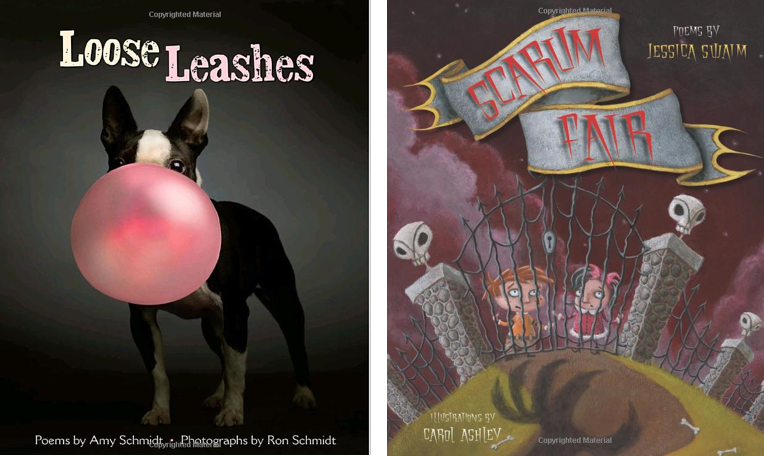 The two books in our final challenge were LOOSE LEASHES by Ron Schmidt and Amy Schmidt and SCARUM FAIR. LOOSE LEASHES came out the winner and the kids were thrilled. This has definitely become the new favorite poetry book in the library this year. I definitely learned (again) that kids LOVE funny poems. They like the others if we introduce them but left on their own, they are drawn to poems that are mostly fun. I was amazed though by how many kids stuck by their less popular choices. It as fun to see individual students find poetry books and poems that struck them for some reason--not understanding why everyone didn't see what they saw in the poem. The process was a good one and the talk around poetry was different because of Poetry Madness. Every week, kids would come into the library, eager to see which books had won, which were left. There was informal talk about the books--they knew titles and poems. My favorite moment of the whole month of Poetry Madness happened on Friday when the last group of 2nd graders was examining the chart. Many were cheering about Loose Leashes. Others were looking back at the books that didn't make it, talking about the ones they wished had gone farther in the bracket. One second grade boy said, "I don't know why, but I really wanted STEP GENTLY OUT to win." I said,"Oh, I loved that one too. Why did you like it?" He said, "I don't know. I guess when I read it, I felt peace." Everyone nodded and agreed. What an insightful comment. It was then that I realized that the small conversations around Poetry Madness had made a difference to lots of kids. In the midst of Poetry Madness, we also celebrated POEM IN YOUR POCKET DAY. Since we had spent so much time looking at 64 great poetry books, it was fun to see the variety of poems that kids chose to carry around that day. It has been nice to see them talking about poems and poetry books so naturally and happily. the Tiger and the star. Have I mentioned recently how much I love teaching fourth grade, especially from February on? Well, I am and I do. Earlier in the year, I shared Blake's "The Tyger" with my students, along with the way-cool video interpretation I first saw at Tabatha's blog, The Opposite of Indifference. S., whose favorite animal is the tiger, overheard me talking about the poem with N. (who tried a few dictionary poems with me in early April). He came over and told me about getting chills when he heard Blake's poem for the first time -- the part (and he quoted) "about 'Tyger, Tyger burning bright/in the forests of the night' " and also when he thought about the answer to the question of who made the tiger. Well, of course it was then MY turn to get chills. I had no idea that "The Tyger" had made such an impression on S. Even after only one exposure, he could quote parts of it. And he, too, loved how Elliott had made a slantwise reference to Blake in his poem. Fourth grade at the end of the year -- it doesn't get much better than that. Elaine has the Poetry Friday roundup today at Wild Rose Reader. Cover to Cover sold books at the Literacy Connection event on Saturday. I always love to buy books at this event because there are always a few new books that I haven't seen. 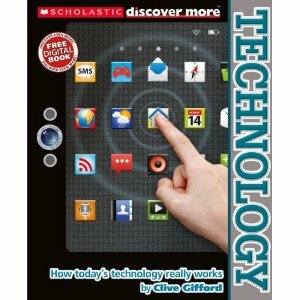 One of my new favorites from my purchases on that day was HOW TODAY'S TECHNOLOGY REALLY WORKS by Clive Gifford. There are so many fascinating topics covered in this book. Topics include information on game controllers, camcorders, and spy tech. This is part of a new Scholastic Discover More series that I think I am going to love! I like the fact that there are books for various age groups. I love the idea of digital companions. I love the topics and the layouts. 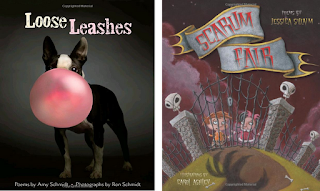 I am always looking for books with 2 page spreads, especially nonfiction--to use with kids in minilessons. I think this series will be great for independent reading as well as minilesson work. Can't wait to see the others in the series! 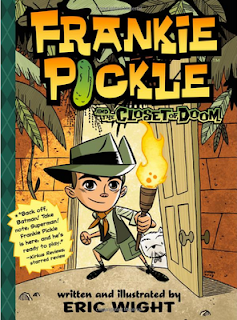 When I found out I was going to be teaching 4th grade next year, I immediately emailed Tony Keefer (@tonykeefer) to recommend some great books that beginning 4th graders (especially boys) might read--books that I would not normally pick up on my own. I love having Tony as one of my reading friends--we enjoy some of the same books but overall, our tastes are different. So I can always count on Tony to recommend good books I may not have discovered on my own. Here are three of the books he recommended that I picked up today. They are series that I have dabbled in but I really need to commit to so I'm ready for lots of different 4th grade readers in the fall. 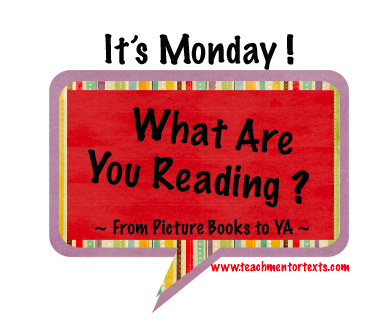 Any other suggestions for great books for early 4th graders?